Shane McMahon’s World Cup win at WWE Crown Jewel was the plan came as a surprise to fans and it looked like they called an audible to cover for The Miz being injured. The reality is that The Miz is not really injured. Dave Meltzer reports that everything they did in the World Cup finals was the plan. It looks like an angle meant to further a storyline that will culminate at Survivor Series. Going into the show, Shane McMahon said if Smackdown lost in the finals then the losing wrestler would be fired. Earlier in the show, Smackdown was referred to as the “B” show so it looks like the story here is that McMahon is desperate to get out of his sister’s shadow. – As seen below, Rey Mysterio’s mask and attire had to be modified. On the graphic shown on TV, the cross was removed. During the event, the letter “R” replaced the cross on Mysterio’s mask and attire. – As noted earlier, there was no Saudi propaganda and no mentions of “Saudi Arabia” at all on the show. They did mention the city of Riyadh. – The camera crew was told to find as many shots of women and kids in the crowd as possible. 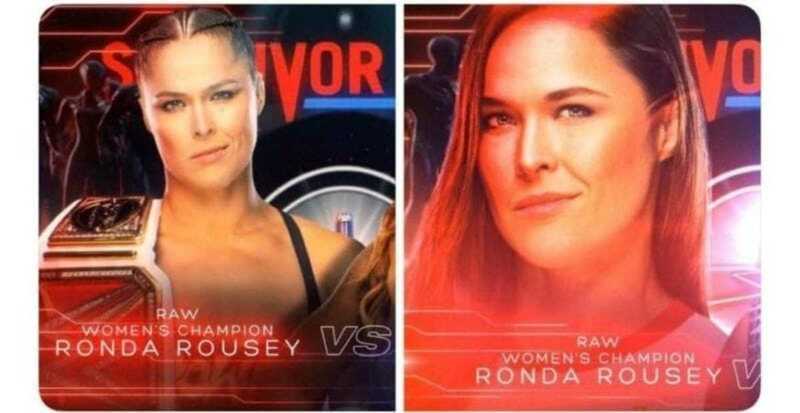 – As you can see below, WWE modified the Survivor Series graphic that featured the women on it. The image on the left is what was shown last week on SmackDown Live. The image on the right is what was shown during Crown Jewel. Basically, they showed a close up of the women to avoid showing too much skin. Renee Young was covered entirely from the neck down during the Crown Jewel broadcast.